For me, it all ended — magnificently — in the cozy confines of the Empire Theatre on Block Island, RI. Having raised our two boys reading Harry Potter books out loud, and seeing several of the movies on various July vacations over the past decade, it was fitting to see the last installment of the last movie on our last day of summer vacation in this historic setting. The theatre was originally a roller skating rink; it is so quaint you can hear the rain on the roof. Vents need to be manually opened around the sides of the atrium if it gets too hot. After the movie my sons (now 19 and 16) were incredulous that I didn’t even hear the vents being opened half way though. That’s how was engrossed in the story I was. What does it say about the power of a film that, even when you have read and re-read the book, you are still completely entranced by its telling on the big screen? A Sorting Hats-off to David Yates for his direction; to Steve Kloves for his taut, elegant screenplay; to the entire cast for inhabiting their characters with depth and charm, above all Alan Rickman, who — in conjunction with Steve Klove’s deft screenplay — helped me understand more about Severus Snape that I ever got from the book itself. For me, it is a first that a movie could exceed a book in this respect. When it was all over, and we were eating waffle cones under the stars in a park next to the outrageously good ice cream parlor behind the theatre, I found myself treasuring most the gift J.K. Rowling has given all of us. When I stopped to think of how many hours of pleasure, wonder, and awe traveled from the tip of her pen to the imaginations of my sons; how deeply her stories had become intertwined with their childhood and our parenthood; and how the fantasy magic of Harry Potter had become almost synonymous with the real magic of our summer vacations to a family reunion in Maine; I wanted to cry right there in my hot fudge-covered Deer Tracks ice cream. 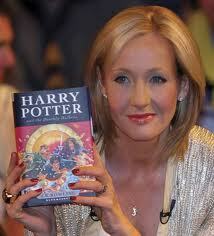 Thank you, J.K. Rowling, for a gift more precious than all the gold in Gringott’s. Harry Potter may be fantasy, but the magic you made was real. This entry was posted in General, Movies and tagged Block Island, Harry Potter, J.K. Rowling. Bookmark the permalink.